All transactions are safe and secure with a reliable history in online purchasing behind each of our associates. 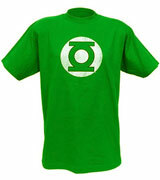 Buy the Distressed Green Lantern Logo shirt to own Green Lantern clothing and merchandise. Pair this distressed Green Lantern logo shirt with a power ring and you'll be ready to protect Sector 2814 sooner than you can say 'Abin Sur'. This design can be used not only for daily use but also as a casual costume for anyone who wants to dress up without going all out. For more exciting adventures, check out the DC comics Green Lantern merchandise in the gallery, including replica toy lanterns, action figures and more. In addition to the Distressed Green Lantern Logo tee above, browse the Green Lantern Clothing Gallery for more apparel like men's and women's clothes, kids shirts or hoodies.